Mix ground flaxseed with a part of the water in a small bowl. Set aside for approx. 5 min. In the meantime, add flour, demerara sugar, spices, baking soda, flaxeed-water-mix, margarine, and molasses to a standing mixer. Knead until a smooth dough forms. Wrap dough in plastic wrap, transfer to refrigerator, and let rest for approx. 1 h.
Preheat oven to 180°C/350°F. Flour work surface and roll dough out until approx. 1/2 finger thick. Using stencils (you will find them in the last step), cut out shapes needed for a gingerbread house. Cut Christmas tree shapes and gingerbread men out of remaining dough. Transfer to a lined baking sheet and bake in preheated oven for approx. 10 – 20 min., in batches if necessary. The pieces should be golden brown with a slightly firm surface. Transfer to a cooling rack. Meanwhile, mix confectioner’s sugar with just enough water to form a thick icing. Once pieces have cooled, decorate with icing using a piping bag. If desired, decorate with sprinkles or other edible decorations. Set aside to dry completely. Melt sugar and a little water in a small saucepan and cook over medium heat until a dark caramel forms. Carefully dip bottom of house pieces in caramel and stick to a serving plate. 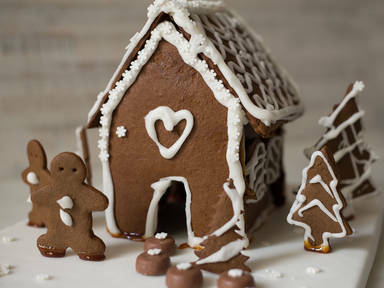 Use caramel to stick together other inner edges and to attach Christmas trees and gingerbread men. For your gingerbread house cut out each template from the dough twice. You can also take the measurements and make your own stencils. Enjoy!